Unique exquisite large Japanese hand painted gilded contemporary Imari porcelain vase presented in an auspicious double-gourd form and combines an arabesque motif with birds and flowers set against a brilliant green background. 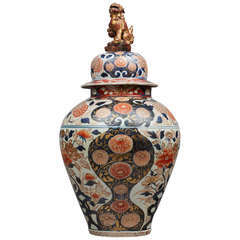 It is a masterpiece by highly acclaimed award-winning master porcelain artist in the over glaze enameling tradition of the Imari-Arita region of Japan. 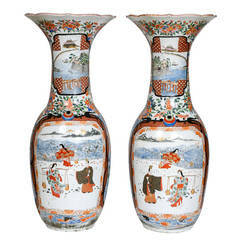 The double gourd has long been used in Japan as an auspicious form symbolizing abundance of both offspring and harvest. Strung together in clusters of three and six, the double gourd is believed to have magical powers of warding off evil and illness. This breathtaking vase depicts highly ornate phoenixes in full flight in a forest of flowers with gold used generously throughout the piece. Special care has been given to creating a subtle gradation effect in the feathers and petals and outlining them with gold to give a cloisonné-like aspect to the central themes of the vase. The base and rim are decorated with an intricate pattern of layered foliage. This artist has perfected the polychrome over glaze technique to create porcelain pieces with stunning colors. He is the recipient of numerous prestigious awards for his extraordinary porcelain work and his contributions to this centuries old art. His signature style is a refreshing interpretation of traditional polychrome over glaze enameling techniques and motifs decorating porcelain over clear glaze. Inspired by nature, he creates a dramatic landscape on porcelain with flowers coming alive. His painstaking “drip painting” technique is designed to bring a subtly raised, three-dimensional feel to motifs that are expressed in bold vibrant colors. The artist's profile is available upon request. This stunning gilded and hand painted porcelain piece comes in a custom-made wooden case with the artist’s signature. Dimensions: H 14 in, D 9.5 in. With a ruffled rim and baluster form, decorated overall with various decoration. 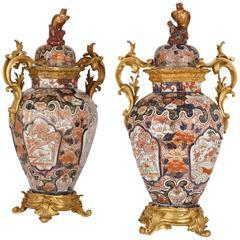 Large scalloped edge porcelain imari palace vase. Hand-painted iron red and cobalt blue with gilt highlights. With original wood base.